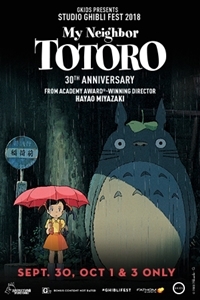 Fathom Events and GKIDS are excited to bring the 30th Anniversary of Hayao Miyazaki's beloved classic, My Neighbor Totoro, to movie theatres nationwide for a special three-day event on September 30, October 1 & 3 as part of Studio Ghibli Fest 2018. When Satsuki and her sister Mei move with their father to a new home in the countryside, they find country life is not as simple as it seems. They soon discover that the house and woods are full of delightful creatures, including a gigantic forest spirit called Totoro! This all-ages animated masterpiece also features the voices of Tim Daly, Lea Salonga, and real-life sisters Dakota and Elle Fanning, in a classic tale of magic and adventure for the whole family.